Use Drupal's "Basic Page" content type to add documentation about your API, such as how-to guides and API reference documents, to your Developer Services portal, and include content such as videos, screencasts, or code downloads. Note: Note: Developers will use apps to access resources in your API products. In general, developers will use your developer portal to add those apps. Ensure that your documentation includes instructions for adding apps though your developer portal. You can use Instructions for adding apps as a starting point. Those instructions cover how to add apps through the default developer portal. The Documentation page is set up with some initial entries organized in various categories such as "Getting Started" and "Tutorials". The page is a starting point for you to edit. In this way you can add you own content entries and organize those entries in the way you want. You can also add a Documentation link to this page in the main menu of the developer portal menu. However, the Documentation home page does not exist by default, so you must create a new page on the developer portal at the correct URL. Select Content > Add content > Basic page in the Drupal administration menu. Enter the title of the document, such as Documentation Home, and the content of the first page. Click Edit summary to add a Summary. Click the Menu settings item below the Body section. Select Provide a menu link, add the link title, and select <Main menu> in the Parent Item. 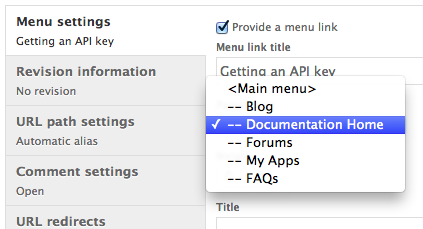 This adds a link to the main menu for your Documentation Home page. Click the URL path settings item below the Body section. Deselect Generate automatic URL alias, and set the URL alias to documentation. By default, the URL of a page is <siteURL>/content/pageName. By setting the URL alias, you set set an explicit URL of the page, in this case to <siteURL>/documentation. You should now see a link to the page in the menu bar, and the link in the in the box on the home page should now work. As an administrator, you'll also see content administration buttons such as View and Edit. Non-administrators won't see those. Enter the page title and the content. Select Provide a menu link, add select the documentation home page menu item. This adds a current page as a child of the main menu for your Documentation Home page. 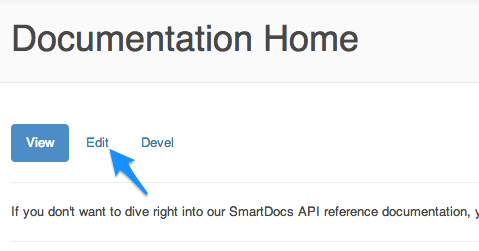 You should now see a link to the page on the Documentation Home page menu. Navigate to the page in the developer portal. You can also click Content in the Drupal administration menu to list all your pages and select one. Select the Edit tab on the page. Open a visual editor by selecting Full HTML or Filtered HTML in the Text Format drop-down menu below the Body section. You should see the content of the page displayed in the editor. Edit the page as necessary. Select Content in the Drupal administration menu. Select the document you want to view. 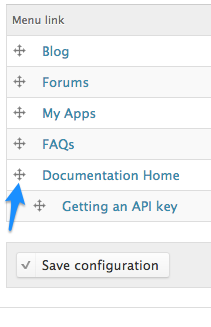 You can change the sequence and nesting level of pages in the Documentation Home menu. In the Drupal administration menu, select Structure > Menus > Main menu. Each item in the menu has an icon to the left of its name. If you do not see the icons, click Hide row weights. To move an item, click and drag the icon to move it to a new location. Dragging an item with child items also moves the children. Edit these pages to add your own content. Select Generate automatic URL alias, and set the URL alias to privacy-policy. By default, the URL of a page is <siteURL>/content/pageName. By setting the URL alias, you set set an explicit URL of the page, in this case to <siteURL>/privacy-policy. Repeat this process for the Terms & Use and Contact pages. Click the Edit tab in the page to open the editor. Scroll down the Blocks page until you see the Site-wide Default Footer block. Select the configure link corresponding to the Site-wide Default Footer block. In the Custom Content area, right-click on a social icon and select Edit Link from the pop-up menu. Or, delete the icon from the Custom Content area to remove it. Select Save block to save your changes. Select Full HTML as the Text Format. 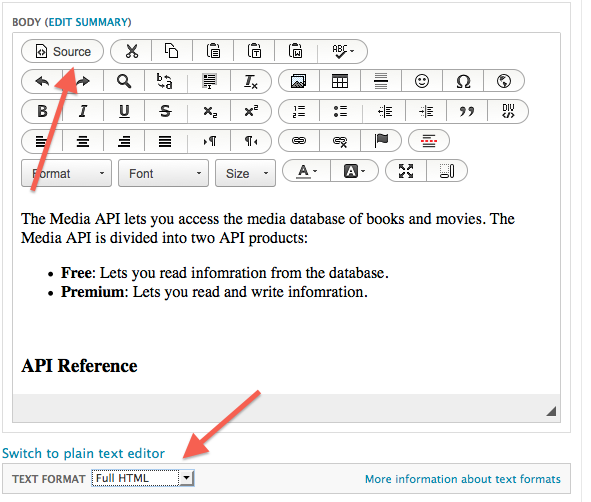 Select the Source button to edit the HTML source code for the page. Note: The Full HTML text format can be configured to limit the HTML tags allowed on the page. For example, it can be configured to prohibit the use of the <script> tag. To determine the settings of the Full HTML text format, select Configuration > Content authoring > Text formats > Full HTML in the Drupal administration menu. If the Limit allowed HTML tags checkbox is selected, then check the allowed HTML tags in the Filter processing order area of the page. It's good practice to check your content for broken links. By default, the developer portal is set up to check various types of pages for broken links. For example, links are checked in basic pages, articles, blog entries, and forum topics. In the Drupal administration menu, select Modules and ensure that the Link Checker module is enabled. In the Drupal administration menu select Configuration > Content authoring > Link checker. Configure the content types that you want to be scanned for broken links. The developer portal provides a built-in search engine implemented by Apache Solr, which uses the Apache Lucene search library. This is the search engine for the site itself, which the user accesses through the search box in the upper-right corner of all portal pages. External search engines, such as Google, can also index your portal. The developer portal lets you control whether or not external search engines can index your portal. You can configure Apache Solr to control the content types to index, to force an index, and to perform additional configuration tasks. In the Drupal administration menu select Configuration > Search and metadata > Apache Solr search. Use this page to configure Apache Solr. It's also good practice to index your content, and make it available to search engines. By default, your content is indexed by the Google indexer. However, you have the option of disabling Google indexing. You might want to do this if your developer portal is not ready for public use and so you don't want your content to be publicly searchable. Select Modules in the Drupal administration menu. In the Drupal administration menu select Configuration > Search and metadata > Metatag. Select Override operation for the Global type. Click the Advanced section to open it. Check the checkbox for Prevent search engines from indexing this page. Notice that there are other search-engine related options in the Advanced section of the Global page. For example, you can check a checkbox to prevent search engines from following links on a page. Check one or more of these checkboxes as appropriate. It is important that your documentation includes instructions on how developers can register their apps though your developer portal. You can use the following instructions as a starting point — these instructions cover how to register apps through the default developer portal. To configure how developers register apps on your portal, see Configuring app registration for more. If you do modify the app registration process, modify the example instructions below accordingly. Select My apps below your username in the login menu. Click the Add (+) new app icon. App name Provide a unique App Name for your app. If required, provide the callback URL to which the OAuth call should return. By default, this value is required even if your APIs do not use OAuth. If your APIs do not use OAuth, enter a dummy value such as my.site.com. Product Select one or more API products. Click Create App to register the app and generate the API key for the app.